The White Tulip Hostel offers clean and comfortable accommodation right in the middle of the red light district. Amsterdam's nightlife is right at the doorstep of the hostel! All of Amsterdam's main attractions are literally inside and just outside! The hostel entrance is located at Amsterdams busiest street for bars and coffee-shops right at the start of the Red Light District. Leaving the central station, it is only a 5-minute walk to the reception. Irish Pub Slainte at the bottom floor of the hostel will provide you great drinks and amazing food! This is THE PLACE to meet fellow travelers while enjoying one of Slainte's beers or mixers. Not only do you get 15% discount on all food and drinks in the bar but we also have daily Heineken Happy Hours! Yes indeed, You buy 1 Heineken you get 1 free! Free Wi-fi, No Curfew, Free Lockers, Free towels, Most central located, Great bar with 15% discount on all FOOD AND DRINKS in the bar, Smoking Terrace, Bicycle hire, Amazing pub crawls, Tours desk and a 24-hour team of friendly staff!! Sandemans New Amsterdam will take you on a 'free tour' through Amsterdam. On this 3-hour walking tour they cover the main sights of the inner city. 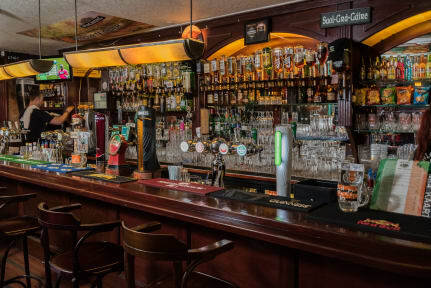 The White Tulip Hostel & Irish Pub Slainte Staff Members will definitely be helping you to get to your bearings in this beautiful city and allow you to make the most out of your stay in Amsterdam! -15% discount on all food and drinks in the bar!! -Bar opening times; 1 am on weekdays, 3 am on the weekends. -Free linen for your beds. -Great party area at the doorstep of the hostel. -Free detailed maps of Amsterdam. -Check out time is 10:30 AM. -We have a 72-hour cancellation policy. (Starts counting from 00.01H on arrival day). Any cancellation you make after the 72 hours will be fined by 1st night payment of the cancellation. -All nights of accommodation must be paid for on arrival at check-in! -Most of the rooms have community showers and toilets. Please make sure you bring your own flip-flops. -All dormitory rooms are NON-Smoking! We have a smoking terrace at the backside of the bar. -Please note that we keep your beds reserved for 2 hours after given arrival time. It's your responsibility to contact the hostel if you are delayed. -There is no luggage-storage available at check-out. All booking exclude 7% City Tax. This needs to be paid upon arrival at check-in. There is no service charge for payments by credit card. Thanks for choosing White Tulip Hostel for your Amsterdam visit. To make sure you AND your fellow travelers have an enjoyable stay we ask you to follow our house rules. The use of any drugs, weed, hash, hallucinates, mushrooms, cocaine, space cake etc is strictly forbidden. The White Tulip dorms are non smoking. The bar and hostel are totally drug free. Please be considerate of our other guests and place all rubbish in the bins. Although the showers and toilets are getting cleaned multiple times a day, we still ask you to leave them clean as much as possible! If there are any complaints please notify the reception directly. Friends and visitors are only allowed between 11 AM 9 PM. Everybody not staying in the hostel must leave their ID at the reception. White Tulip Hostel is not responsible for any theft. We advise you to place all your belongings in the free lockers. Please respect your fellow travelers and keep the noise down after 23PM. Great staff. No internet in the rooms only in one tiny common area. If you need the internet this isnt for you. When I showed up to check in, they didn’t have a bed for me so they sent me to a different hostel and made me pay a £15 fee. Also THE WIFI DOES NOT WORK HERE! Save yourself some trouble and stay somewhere else. The hostel definitely brings in some disrespectful people. Not once, but twice, I was cornered by two different men who put their arms up to block me from leaving a small space, both times in the bathroom. Once I was jay brushing my teeth and the other, washing my hands. The bathrooms smelled horribly of mildew. Bring your slides. The beds were comfortable and clean. The location was awesome and staff were friendly, easy check-in process. When we arrived at white tulip at 11:30pm, they informed us that they had overbooked the hostel. They did not inform us of this ahead of time, and instead said we could share one bed for the night (without any discount) or find somewhere else to stay. The bathrooms were unclean and there were virtually no facilities.